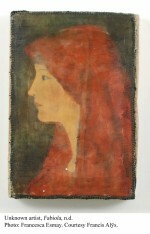 More than three hundred copies of the same profile, cloaked in red, against a blue museum wall is striking to the eye. 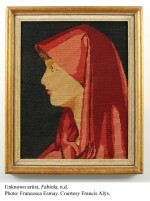 Some of the portraits are in oil, some in acrylic, cross stitch, fabric, one in seeds and beans. All of these works of art belong to the same collector. But the collection described above is most striking because it can be found among the European Old Masters at LACMA. If you weren't forewarned, you might be poring over the Spanish sepulchers when suddenly, unexpectedly you'd find yourself surrounded by a room full of amateur paintings; not exactly what one expects when visiting the permanent collection of a world-renowned museum. These amateur paintings have been collected over time by Belgian artist Francis Alÿs, whose only criteria for acceptance was that the painting depict the image of Fabiola, a fourth-century Christian saint commonly considered as the protector of abused women. 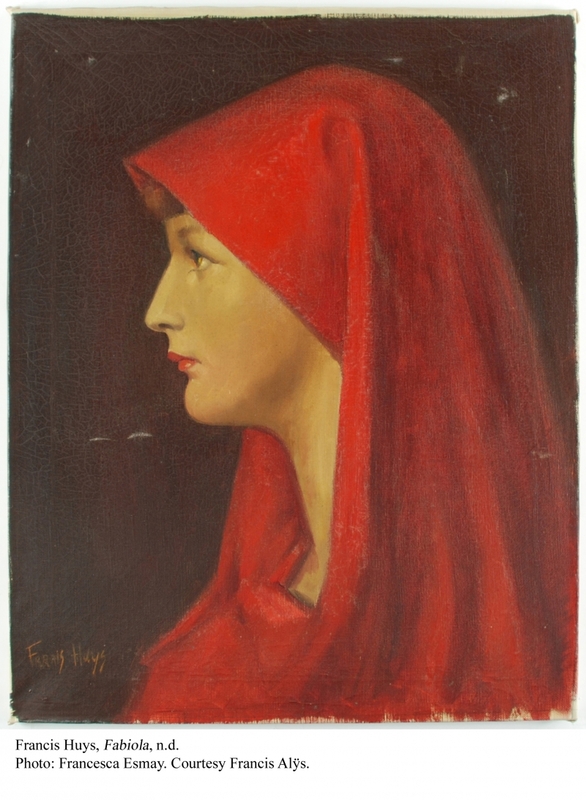 The original painting by Jean-Jacques Henner was created in the late nineteenth century and subsequently lost; meaning that any painting that now exists of Fabiola, with her characteristic red veil and pinkish lips, would have to have been made from an existing reproduction. 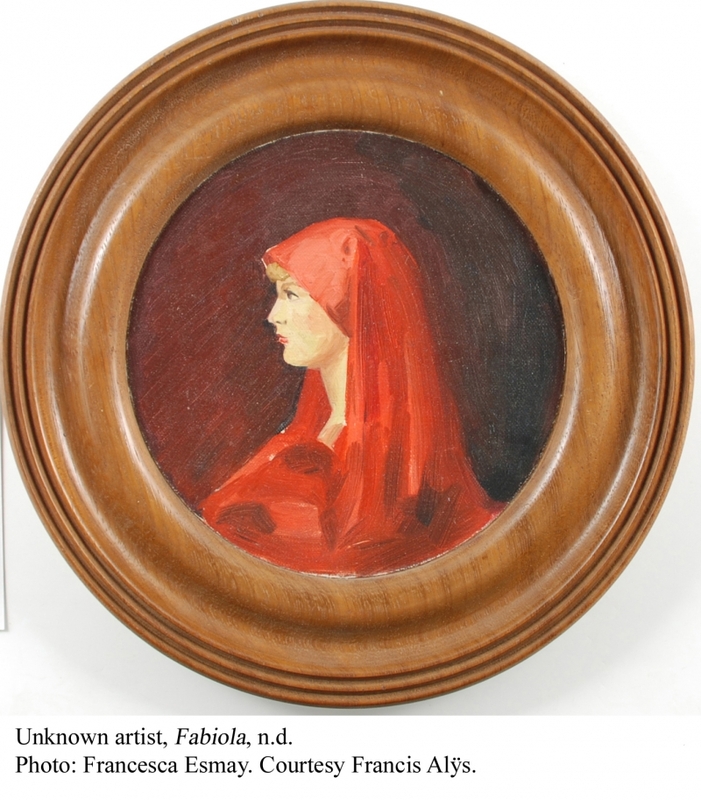 As the authors of the Fabiola paintings on display at LACMA are unknown, one is left to observe the minute details that differentiate one painting from another. The frames are all inevitably different, size and color often vary, and materials used can be very diverse as well. But the most variable of all is inevitably the individual style each piece has. 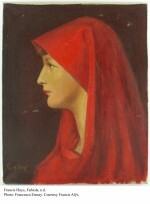 Fabiola's features and expressions change so often that it appears as if this part may have been left entirely up to the imagination of the artist interpreting the saint. Some Fabiolas are dignified and strong, others shy or innocent-looking. 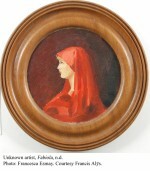 This wide assortment is of course due to the amateur status of the painting's authors, whose work in many cases ended up in thrift stores or flea markets in Mexico or Belgium. The lack of artistic professionalism betrays itself in every misshapen chin or discolored complexion. While Jim Shaw's thrift store paintings may come to mind, it might be more helpful to refer to Francis Alÿs's previous works, many of which were collaborative projects conceived during the time that Alÿs first moved to Mexico City, giving up his architecture career. Inspired by the aesthetics of a city which “...provokes an urge to react, you can't ignore it or it'll beat you...” as the artist commented in an interview, he began commissioning works by commercial painters who were instructed to recreate existing signs, employing acts of détournement which would alter the original intended meaning. Hundreds of these paintings were created for this project, which not only displayed a marked interest on Alÿs's part in working with others, but also initiated a serious investigation into the question of artistic authorship. In another project, Déjà Vu, Alÿs created fifteen paintings along with fifteen copies of each of these, adding up to a total of thirty. The fifteen paintings were exhibited in separate rooms of a museum, with their copies interspersed at random among the originals. The expected result was one of having already seen the same thing before, or déjà vu as the title suggests. Although this time artistic authorship isn't at stake- Alÿs painted each of the thirty paintings himself, the idea of the unique art object is again being called into doubt, with its byproduct being a feeling of destabilization in the viewer. This unsettling feeling recalls the one brought on by Alÿs's roomful of Fabiolas- it is a moment of uncertainty which can only be attributed to the artist's thoughtful and incisive attempt at upsetting traditional conceptions of what an artist should be doing in society today. Alÿs's intervention at LACMA is successful in that it calls into question the role of the artist in contemporary art. 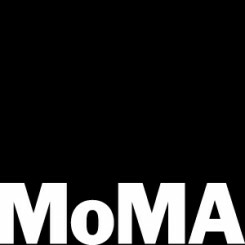 In addition to raising the question, he poses it in the right place; at an institution that is well known for its relative conservatism in the art world. 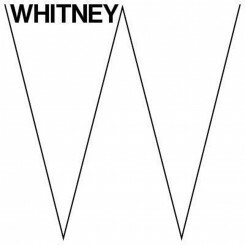 The new Broad wing, for example, plays like a Best Of sampler of American contemporary art. And a recent survey of Latino contemporary art seemed if anything, way overdue. Although Alÿs's work may seem a bit out of place in the galleries among the Old Masters, above all since he considers himself a kind of accidental artist, there is no question as to the exhibition's success. Perhaps what is as yet unclear is whether LACMA's public will accept and integrate this sort of disconnect. Cynthia Valdez is a writer in LA.